Durex sent us a rockin' box full of adult toys, treats, recipes, cocktail ware, fun little love notes and dares-- AKA: The “Play Together, Stay Together” Toolkit. Do you ever find life imitating a twisted reality show? Ours is called The Last Couple Standing. I've been with my soul mate for over 15 years and we've been married since 2000. Over the years we've seen dozens of our friends' relationships and marriages implode and dissolve. It's become such a regular thing that whenever we hear that another one bites the dust, we come home to each other and say we're one step closer to the "Last Couple Standing... again". That's why we are pretty excited to partner up with Durex on their Get Closer Go Farther campaign for a series of sponsored posts. Want to stay in the Last Couple Standing game? Relationships take work... and play. We'll be sharing our own success story with you, as well as some relationship "sparks" and interesting stats from Durex. 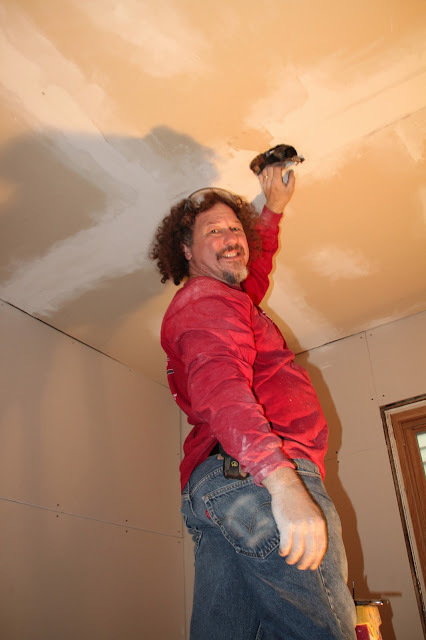 The hot handyman fantasy... We just gave our bedroom a total DIY makeover that involved breaking out old plaster and lathe walls, drywalling, new floors, etc. We had lots of fun on "work breaks" when my handyman husband would come out and flirt with me... and more. He'd pretend to be a contractor/stranger with the hots for me, which is a hoot after you've been with someone upwards of 15 years. It gave us a chance to be flirty and creative with lots of cheesy innuendo and handyman puns. I've always been a sucker for guys in bandanas, and there's nothing sexier than a guy who gets things done around the house! Speaking of workman puns... we were given a “Play Together, Stay Together” Toolkit from Durex and we're not afraid to use it! They sent us a rockin' box full of toys, treats, recipes, cocktail ware, fun little love notes and dares. We'll have more info in the coming weeks, about fun ways to keep the spark in your relationship with the Durex Get Closer, Go Further campaign. Check out more Durex “Sparks” for inspiration by clicking the link. I'm stoked to support Durex’s campaign to help couples Get Closer, Go Further both physically and emotionally, and I want to encourage all of my readers to do the same. Don't let us be The Last Couple Standing. Stay in the game. Comment below on how you keep your relationship flirty and fun. You can even get closer & go further south of the border--no that wasn't sexual innuendo, people! Enter to win a free vacation to Mexico from Durex! Disclaimer: I received a “Play Together, Stay Together” Toolkit from Durex for the purpose of this campaign. All opinions and the hot handyman are 100% my own!